For many years, the Matane River has been known as the salmon fishing school in Québec. Many fishermen have caught their first salmon on this river. The Matane River is easily accessible on all its length. 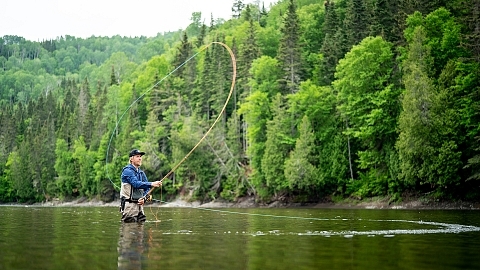 Fly fishing school: The Initiation Rivière Mataneprogram is unique. It wil help you to learn the right way to practice salmon fishing. If you are an adventurer in search of a new challenge or an angler wishing to improve his techniques, the Matane River Fishing School is offering you the chance to do so. You can do it alone, with friends or with your family (we provide the equipment for the formation). 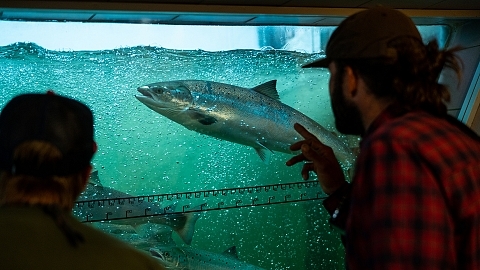 Observe a natural phenomenon at the dam Mathieu-D'Amours: From the coast of Greenland passing through the St. Lawrence River to the mouth of the Matane River, the Atlantic salmon travel this long journey with the sole purpose of reaching its spawning place. Two windows give you the opportunity to observe this anadrom fish at the time of its migratory pass through the fish ladder. And through different displays, it is possible for you to discover a magnificient river, populated with the king of fish: the Atlantic salmon. See rates on the website.